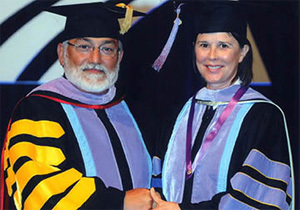 The Academy of General Dentistry (AGD), a professional association of more than 37,000 general dentists dedicated to staying up to date in the profession through continuing education to better serve the public, is pleased to announce that Dr. Ana Brightleaf, D.M.D, MAGD, of Santa Monica, California, received the association’s 2011 Mastership award during the AGD 2011 Annual Meeting & Exhibits, held July 28 to 31 in San Diego, Calif. The Mastership award is the highest honor available at the AGD and one of the most respected designations within the profession. To accomplish this goal, Dr. Brightleaf completed 1,100 hours of continuing dental education. As a recipient of the Mastership award, Dr. Brightleaf joins more than 2,200 active AGD Masters who understand that providing great smiles and good oral health for their patients are the result of going above and beyond basic requirements. “We are proud to honor Dr. Brightleaf for her commitment to provide the highest quality of oral care to their patients,” says AGD President Howard Gamble, DMD, FAGD. “There are more than 100,000 general dentists in the country and less than one percent of those are Masters with the AGD. It’s a remarkable accomplishment for Dr. Brightleaf. Dr. Brightleaf graduated from University of Florida in 1982 and currently practices dentistry in Santa Monica, California. In addition to the AGD, Dr. Brightleaf is a member of the IACA (International Association of Comprehensive Aesthetics). Dr. Brightleaf and her husband, Charles, have one daughter, Feather Lowery and grandson Logan Lowery.